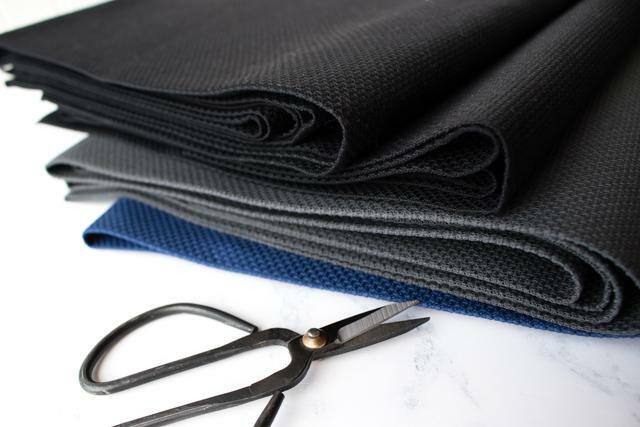 Here are some useful tips we found at Stitched Modern about how to stitch on dark fabrics. Enjoy the read! 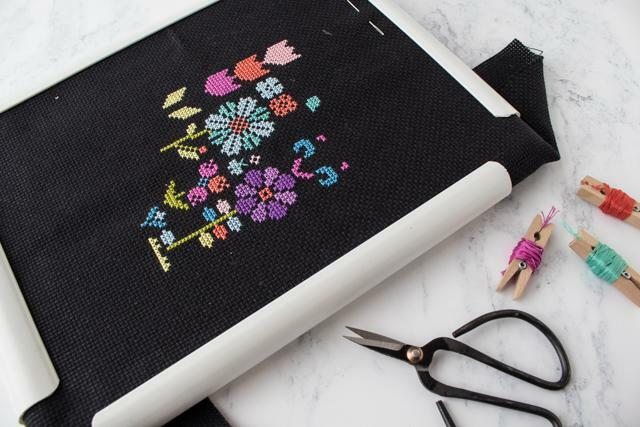 “I love the look of cross stitch on black fabric – the vibrancy of the colors and the way designs pop on a dark background. But stitching on black or dark-colored Aida or linen can be a challenge. Here are some tips to make it easier. It always helps to have good lighting when you cross stitch, but this is especially true when working on black or dark fabric. Make sure you have a good light source above you when you stitch. It can also be helpful to have light from below to illuminate the holes. During the day, light from a window can work. At night try a desk lamp or other small lamp placed on the floor. Don’t shine it directly up into your eyes, but instead go for indirect light. The holes in black fabric are easier to see if there is something white in the background. I often drape a white pillowcase over my lap when stitching on dark fabrics. A piece of white paper also works in a pinch. It’s amazing what a big difference using a white background can make. Next to good lighting, this is the single most important thing to do when cross stitching on black. Take a look at the image below. The right half of the frame is held over a white background, while the left half is over a dark background. Notice how the holes on the right side stand out so much more. It really does make a huge difference! I don’t always use a hoop or frame when I cross stitch, but I do when stitching on black. It is much easier to see the holes when the fabric is taut. Put your fabric in a hoop or frame (I like Q-snap frames), and pull the edges of the fabric gently unit it is tight. Just be sure you don’t pull so tight that you distort the weave of the fabric. You may not normally need glasses when you stitch, but consider using them when you stitch on black or dark fabric. I have an inexpensive pair of drugstore reading glasses that I keep handy for such occasions. They come in different strengths, so you might want to try a few. Bringing a piece of fabric with you to the drugstore will help you pick the perfect pair. If you have one, you can also use a magnifying lens made just for stitching. They come in various styles, so you may have to experiment to find the one you like best.